Lie the beef slices flat, season with salt and pepper and spread a thick layer of mustard on each one. Put one slice of bacon on each then layer with some gherkins and sliced onion rings. Roll each one and secure with tooth picks. 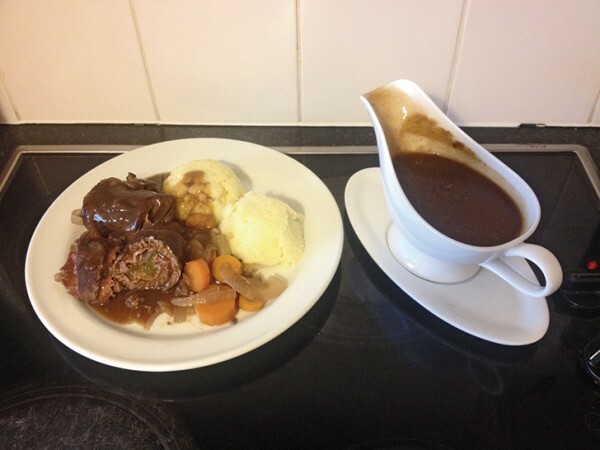 Heat oil in a casserole dish and braise all sides of the beef. Add the roughly chopped garlic, onion and carrots. Add beef stock and red wine. Cover and cook in the oven at 180 degrees for 2 hours. Remove roulade from dish and allow to rest for 10 minutes. Meanwhile, reduce the remaining liquid to make a delicious sauce. This dish is usually served in Germany with red cabbage and mashed potatoes.